School-Managed License (PC and Mac®) – Minimum purchase is 30 licenses at 12.75 each. • Allows access to the software on a fixed number of computers for specific users. • Software can be deployed with many standard deployment methods. • Software license contains a “grace period” allowing software to be used at home or outside of the school’s network for 30 days. After this grace period expires, the computers must connect to the schools network to continue use. • Perpetual Licenses require an annual license extension at no additional charge. TI-Nspire Student Software for homework. The TI-Nspire or new full-color TI-Nspire CX graphing calculator for class assignments. Identical handheld– software functionality. Take what you’ve started in class on the handheld and finish on your home PC or Mac® computer. Transfer class assignments from handheld to personal/home computer. Complete your work outside of school, at home, on the bus, in the library. Calculate, graph, write notes, build spreadsheets and collect data, all with one software. 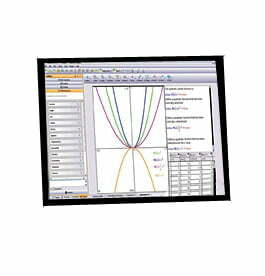 View multiple representations of a concept on a single screen.